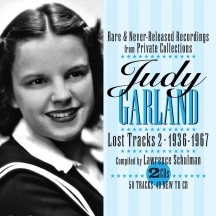 The Judy Garland Renaissance Continues with more lost, ultra rare and stunning tracks. JSP Records' best-selling 2010 release Judy Garland: Lost Tracks 1929-1959 contained countless unreleased tracks. Lost Tracks 2 1936-1967 picks up with newly discovered gems. The Judy Garland (1922-1969) renaissance continues under the guidance of Lawrence Schulman, the man behind all JSP's acclaimed Garland sets. Audio restorations are by John H. Haley and sleeve notes by historian Scott Brogan.